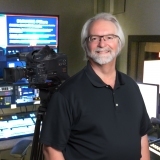 Steven W. McGrath is a charismatic, dedicated, media production and corporate communications expert who has been the Owner/Principle for McGrath Media Productions for the past 30 years. His key responsibilities involve helping Fortune 100 companies have successful seminars and live business meetings He focuses on creating powerful marketing tools and educational messages, while motivating employees and customers. Steven excels in customer service, and has the ability to take an idea from a client and turn it into something tangible and marketable. He is ultimately responsible for all aspects of business operations, including overseeing the budget, planning, employee recruiting, and marketing. Since 2010, he has also served as Managing Partner of Visual Wizards Media LLC, a communication production company working with companies small and large, parlaying his vast experience in corporate communications with Fortune 100 companies in the areas of network news, professional sports, live events, laser and musical entertainment, and interactive webcasting to meet their electronic communication needs. He is also SBE Certified with the Society of Broadcast Engineers. Steve received a Bachelor of Science in Mass Communication with a minor in Marketing and Music from Southern Illinois University, Edwardsville in 1978. Steven attributes his success to the mantra of keeping his mouth shut and his ears open. He has maximized results for his clients by finding the most effective ways to deliver their message, and once they hire him, people tend to stay with him. Going forward, Steve wants to build up his business, do less advertising and marketing, and further develop his existing client base, while managing the brand.He is keen to network, enhance his branding, and expand the business while exceeding customer expectation. Among the many highlights of his career includes working for ABC Nightline for 5 years, working with presidents, major movers and shakers in the entertainment industry, and many of the major national advertising agencies, but Steve believes the best is yet to come and doesn't want to rest on his laurels. In his spare time, Steve enjoys target shooting, listening to music, and attending concerts and plays. He also supports Ronald McDonald House.